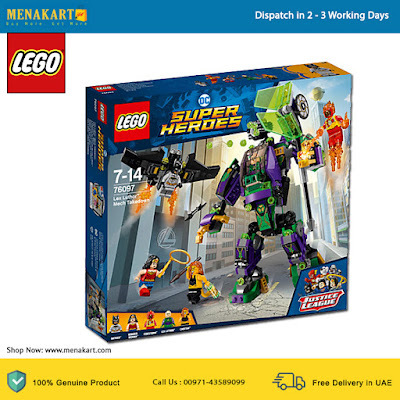 Work with the Justice League heroes and pick up the Energy Infuser from Cheetah with this LEGO DC Super Heroes Lex Luthor mecha victory set. The mecha contains an opening minifigure cockpit / escape capsule, adjustable 6-shot rapid fire guns and attachment points for 3 collectable Energy Infusers. This superhero toy for boys and girls includes Batman's Bat-Glider with 2 bubble shooters, the buildable green Energy Infuser, 5 minifigures and various translucent-orange Power Burst elements to suit your buildings and minifigures. Includes 5 minifigures: Lex Luthor ™, Batman ™ (in Rebirth Batpak), Wonder Woman ™, Firestorm ™ and Cheetah ™. The Lex Luthor ™ mecha includes an opening minifigure cockpit / escape capsule, adjustable legs, arms and fingers, adjustable 6-shot rapid-fire guns, a buildable ax, attachment points for 3 collectable Energy Infusers and an attachment point for the kryptonite prison from the Superman ™ and Krypto ™ kit work together (product No. 76096). The escape capsule of the mecha has folding wings, an attachment point for an Energy Infuser and 2 detachable rifles. The Bat-Glider has an attachment point for the Batman ™ minifigure, 2 bubble shooters and translucent-yellow lamp elements. Contains no less than 10 translucent-orange Power Burst elements to suit your buildings and minifigures. Also including the green Energy Infuser to build yourself.